For anyone looking at the tracker on the website today, you may have wondered why I appeared to head up the ‘wrong’ mountain…! Well, it wasn’t a glitch, but an acclimatisation climb up to Camp 1 on Broad Peak. Broad Peak neighbours K2, and at 8051m is one of only 14 8000m peaks in the world. 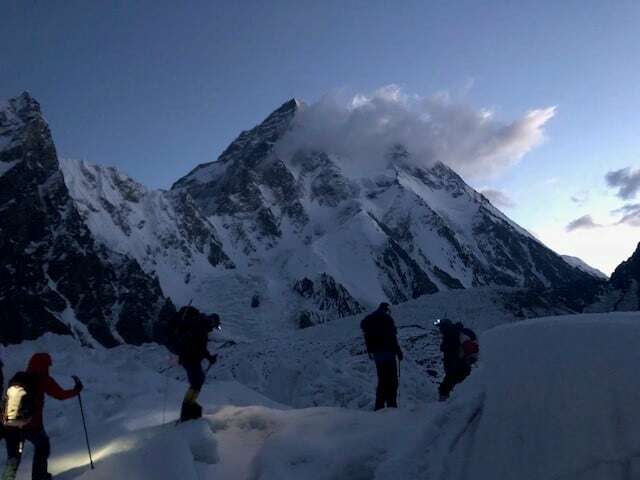 Having been up and down K2 so many times before, I fancied a change of scenery, and we are in the process of adjusting our climbing permit to get me on Broad Peak as well as K2. Here in Pakistan, any attempt to climb a mountain over 6500m requires a specific permit for that mountain. 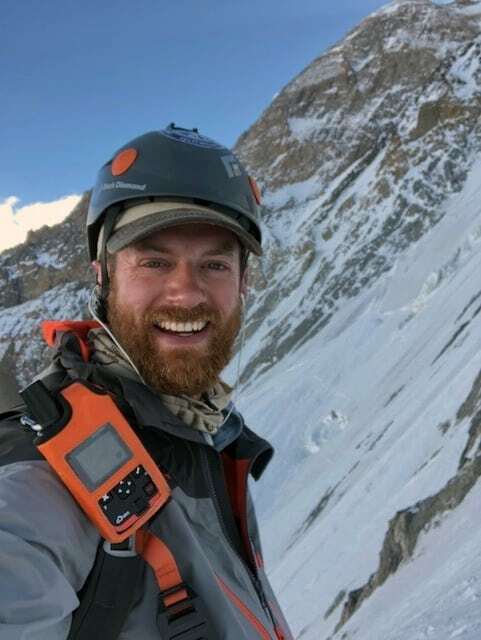 We have a spare slot on our Broad Peak permit, as one of our climbers for the Broad Peak expedition had an accident in Islamabad before the expedition even started, and had to get medically evacuated back to the USA. Acclimatisation is vital preparation for an attempt at any big mountain, but the beauty of it, is that acclimatisation is acclimatisation, and it doesn’t matter where you do it. Many climbers who attempt really big mountains will often do some preparatory acclimatisation before, which could take place anywhere in the world. We planned to have breakfast at 0300, in order to leave by 0400. The reason for an early start like this is to be able to climb as much of the route as possible whilst it is out of the sun, which means that the snow is hard and solid underfoot, and not starting to melt. It’s also physically easier to climb when it’s colder, so that you’re not overheating. Whilst of course this means that you have a rather unpleasant early start, which is also quite cold, you soon warm up. The old adage is ‘be bold, start cold’ – referring to not wearing too many layers when you start walking. You want to try to minimise sweating whilst you are walking/climbing, as not only will this dehydrate you, but inevitably when you stop, you start to cool down, and if you’re very sweaty, this can lead to hypothermia. It takes some getting used to, and different people run at different temperatures, so whilst I might only wear a thermal top and a Gore-Tex jacket (as I get quite sweaty! ), the Sherpas (who don’t seem to sweat at all) might be in a down jacket all day! Either way, mismanagement of temperature regulation is not only uncomfortable, but can be dangerous. 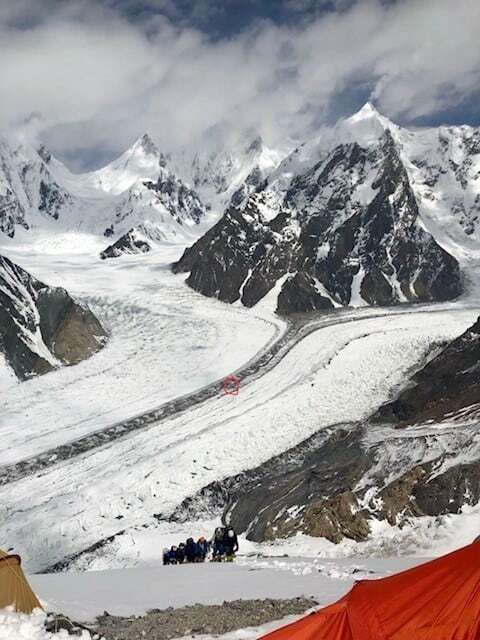 As I’ve mentioned in a previous blog, our basecamp is situated on the glacial morraine halfway between the traditional Broad Peak and K2 basecamps. Unfortunately for us, the direct route from BC to the base of the Broad Peak climb is blocked by a wide (and rather cold) glacial river, which means that the Sherpas had to get creative with the route to find a safe crossing point (which they’d recce’d yesterday). Annoyingly, this meant that we had to walk up towards K2 (in completely the opposite direction) until we could find a strong enough snowbridge over the river. Once we’d navigated this, we then picked a higgeldy-piggledy route along and through the glacier to the bottom of the route. We marked this with bamboo canes with coloured material, so that we could retrace our steps in the most efficient way possible, and to help us find our way back if the visibility dropped (although to be fair, we could probably do with a few more canes to help in this instance!). There was a huge amount of avalanche debris underneath the route, which is unsurprising considering the amount of snow the area has had in the last few weeks. Whilst this is of course indicative of risk, and somewhat daunting, we picked a route that hugged the rock on the side of the slopes, where the debris was minimal. The start of the ‘climb’ is denoted by the ‘crampon point’, which is the area where (as the name suggests) you put your crampons, harnesses and helmets on, and often the fixed ropes begin. Looking up at Broad Peak. The red line denotes (very roughly) the route from the base to Camp 1 on the ridge line. Whilst it looks like we get quite high – the perspective is worryingly false. There is another 2450m of ascent from Camp 1 to the summit! Surprisingly, some sections (including some quite steep 60 degree sections) were without rope, but I imagine that the ropes had probably been buried by fresh snow or avalanche debris. This meant that around 40% of the climb was done without a rope. As it was still cold, and the snow was consolidated and solid, this wasn’t too much of a problem, but at times did require a certain amount of front pointing (on the tip-toes of you crampons), which is more tiring on your calves. Whilst during the walk to the base of the route, I’d been hanging around at the back of the group taking photos, when we got to the crampon point, I made sure that I got onto the ropes first. I suspected that I might be climbing a little faster than some of the others, and preferred not to get caught in the queue, even if this meant I might have to break trail a bit. There were also a couple of the team who were less confident on fixed ropes, so it would be easier for them to climb with a Sherpa nearby, who could help if required (in the end, everyone did admirably!). Feeling strong, fit, and with perfect conditions (even with the absence of ropes at points), I climbed quickly and efficiently – and covered the ground (and height gain) smoothly. In the end, I climbed the 5-600m from the base to Camp 1 in exactly 2 hours, and arrived at the camp only 4 hours after we’d left Basecamp. The others took it a bit more steadily, with Dan arriving just under 2 hours after I’d got to Camp 1, and the last person coming in around 2.5 hours after I arrived. Jake on the ascent to Camp 1 on 45-50 degree slopes. Headphones in – listening to a talking book! Camp 1 on Broad Peak (which we can see from Basecamp) is situated on a narrow ridge, which I imagine is normally rocky, but was covered in a lot of snow. There were around 7 tents there (there isn’t much room for many more), of which at least 4 had been damaged and buried by heavy snow fall. I expect 2 of these would be irretrievable, as poles had snapped and flysheets ripped. Not long after I arrived, the sun started to appear over the top of the mountain (we climb the west side of it, so get the early morning shade), and I was bathed in a lovely warmth. The air temp was probably hovering just around 0 degrees, so it was still worth putting my down jacket on, but the warmth of the sun on my face was lovely! A couple of Ukrainian climbers were descending from Camp 2 (to basecamp), and we had a good chat as they caught their breath (with cigarettes!) as they passed through. 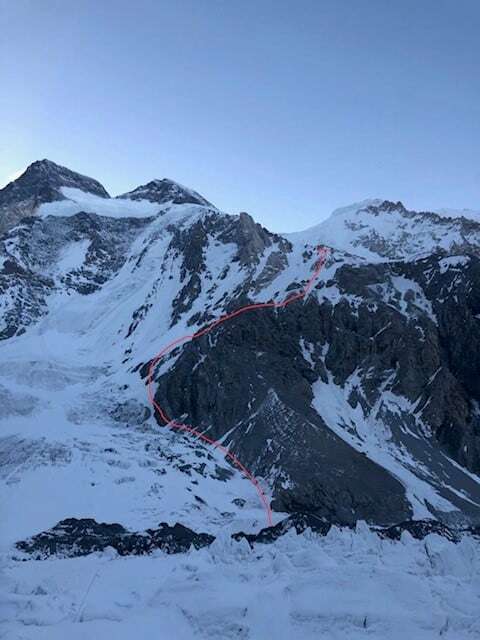 They’d climbed up through the night to Camp 2 a couple of days ago (we’d seen their head torches on the lower slopes at around 9pm), breaking trail through the fresh snow that had fallen. It sounded pretty miserable, and hard work, and they were now descending as their weather report was threatening 40cm of snow (tomorrow), and they wanted to get well off the mountain before the supposed storm hit. I also chatted with a few Pakistani Hight Altitude Porters (HAPs), who were load carrying for another team. I didn’t stick around too long after the rest of the team arrived, having been in Camp 1 for nearly 3 hours by that point, and started my descent. I ‘arm-rapped’ much of the fixed rope (where it existed) on the way down. This is a faster (but slightly more risky) technique of descending than abseiling, and involves having a safety line clipped to the rope, and then using a twist of rope around the arm to create the friction to slow your descent. The risk of course, is that if you let go, or don’t have enough friction in the system, then you’ll fall as far as the next anchor point (where your safety line will catch you) – as some of the ropes can be up to 70m between anchors, this would hurt! The route back through the glacier to Basecamp was tedious in the extreme. Not only was I tired, but the snow was slippery and slushy, and to top it off, it was uphill most of the way! I clambered back into Basecamp at around 1230ish, having been out for nearly 9 hours. Sometimes these early acclimatisation rotations (especially where you ‘touch’ a camp and return) can be the most exhausting, as you’ve got to do both the up and the down in the same day. The rest of the team arrived (equally tired, but happy and safe) at around 4pm. The perfect weather conditions of this morning are no more, as I finish typing this blog on my iPhone, the temperature has dropped significantly and it’s snowing… whether it’ll live up to the Ukrainian forecast of 40cm over the next 24 hours, I don’t know (I hope not), but either way, it’ll be early beds for all of us tonight.